How Far is Green City Homes? Green City Homes is coming up with beautiful flats having abundant space and soothing interiors. Each apartment is being built with choicest floorings and fittings. These elegant apartments are coming up for those who needs everything best in their life. 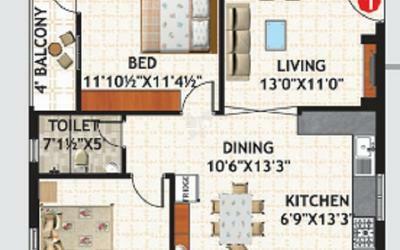 Offered in a range of 2 BHK, these are built with top branded floorings and fittings. 9” thick rat trap insulated outer walls and 4.5” thick inner walls with red clay bricks in cement mortar and putty finish. Plastering Internal and external plastering with cement plaster. Two external coats of weather shield paint and two internal coats of plastic emulsion. Doors and door frames finished with enamel painting. 2’x2’ vitrified tiles and anti-skid ceramic tiles for toilets and balconies. Teakwood door frame with teak framed shutter for main door and teak wood door frames with quality flush door shutters for internal doors. UPVC sliding windows with M.S grills. 6’ 6“ high dado with designer wall tiles. Sanitary fittings of standard make. CPVC plumbing from “Astral” or equivalent make with standard CP fittings and provision for exhaust fan. provided with stainless steel sink mounted on granite counter and dado with glazed tiles up to 2’ height and provision for exhaust chimney. 24 hour water supply for all flats. Three phase power supply for each individual flat with concealed copper wiring. AC points for two bedrooms. 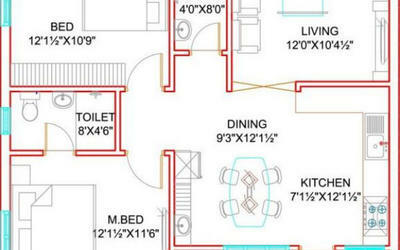 Power points for cooking range, chimney, microwave, refrigerator, mixer and grinder in kitchen and geyser point in toilets. Two passenger lifts of a capacity of eight passengers-standard make. Cable TV provision in living room and master bedroom. Telephone points in living room and master bedroom. Intercom for all flats. Generator for lift, bore-well and common area lighting. Inverter power backup provision for lights and fans in all flats. Rainwater harvesting pits. Common sewerage treatment plant (STP). Clubhouse membership for all residents with nominal fee. Fully developed park and playpen. Lord Venkateswara temple.